100% Compatible with all Finger Print machines. Say good bye to manual salary calculation & making. Our payroll software 100% Compatible with all Finger Print machines. .
You can import data from any punching machines exported excel file. You can check sync log file details as per punching details with date & time. Easy to Attach employee complete details with finger print machine user id. It is easy to setup salary structure as per designation. Automatically calculate monthly salary of employee just an single click. 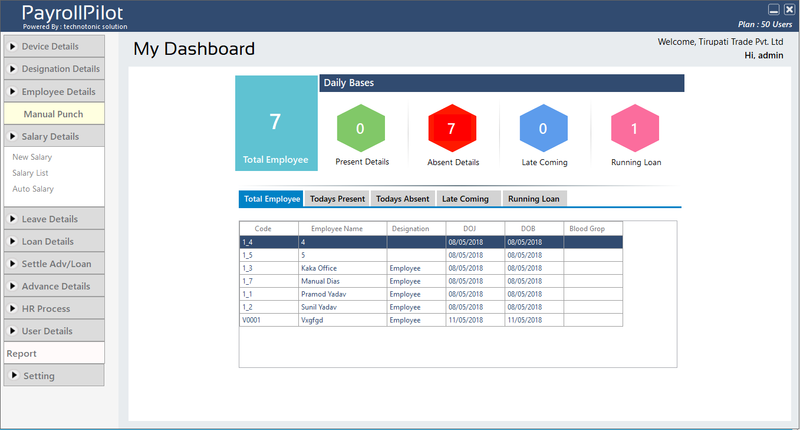 You can check Absent, Present, Leave days in salary dashboard. You can check even total deduction & todal earning amount at time making salary. You can even take print-out of salary slip of particular employee after . You can create multiple employee salary slip on single click using Auto Salary Option. Easy to create or manage advance or loan for employee. Easy to view or print EMI list till date user get loan. While making salary software will automatically show EMI amount in deduction list for both i.e. Advance & Loan. User can settle loan or advance at any time using settlement option. Easy to detail about salary process i.e. How HR transfer particular employee salary to his/her account. HR can add details about promotional of particular employee. HR can add details about employee resignation. Easy to Design and Changes Employee Template. Single Click to Export Offer letter of every employee. Get Promotional Letter of Employee. Export Experience Letter on Single Click.